This morning was my "morning off" - the one time each week when we make an effort as a family to ensure that I have a few hours to myself, outside of the house. I checked out some rummage sales (including a really great one at a local Montessori school that featured some inexpensive yet high-quality toys!) but I started off the morning by going to Mass. I didn't go to our parish, but to a parish with a later daily Mass time (that also happened to be on my way to the rummage sale). It's pretty rare that I go to Mass by myself these days. I can't even remember the last time I did, but I think that it was either after Sister Stinky's bedtime or the time when Sister Stinky was sick. 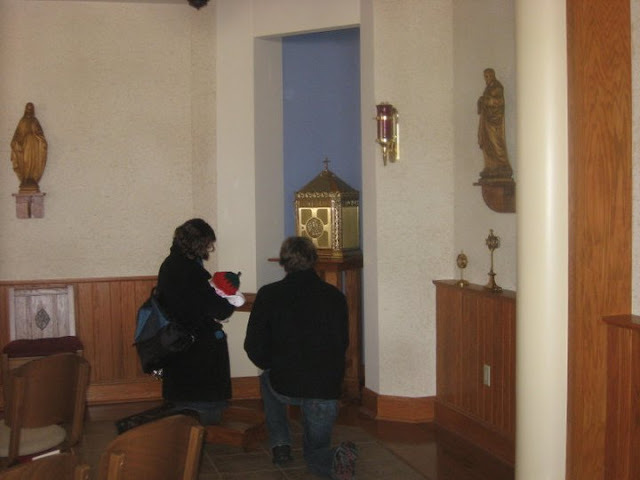 I'm able to get out to adoration by myself more frequently, because I've discovered so many local parishes that offer adoration later in the evening. But Mass...usually attended with a little toddler in tow and usually spent focusing much of my energy on helping said toddler not have a meltdown. It's a real treat to be able to listen to the readings and the Eucharistic prayer (do you know how much longer the Eucharistic prayer seems when you're pacing in the back of the church with a wiggly toddler?). In front of me at Mass today, there was another young mother, with a slightly older toddler in tow. She and I commiserated after Mass about how difficult - yet important - it is to take a toddler to Mass! And yet...I watched she and her daughter as they went to Communion together and it reminded me of the reason why I bring my own daughter to Mass, time and time again - so that she can be in the presence of Jesus in the Eucharist. A very little Sister Stinky wearing her strawberry cap and visiting Jesus. The Abbot and I have a rule in our little domestic monastery (a rule that goes all the way back to our early days of dating!) - whenever things seem overwhelming, whenever we aren't sure how we can keep going...we go to Jesus in the Eucharist. This is much more difficult to do these days, but when we are able to come to Jesus in the Eucharist (even individually, or with only two of the members of our family visiting Him) we inevitably find that we are given the grace we need to keep going. In the very, very early days of our parenthood we had reached a point of total burnout, and were seriously wondering if the hospital had a return policy for newborns. Thankfully, we lived only a few blocks away from a church that was open all day, every day. So, we loaded up for the short drive, and sat in the dark church, with our little Sister Stinky sound asleep in her car seat beside. We prayed for the grace to keep going, and we prayed that we wouldn't have a sleepless night with our stinker. As we were praying, we happened to see a priest friend of ours, who was newly ordained (we had attended his ordination a few months prior) and who had been recently placed in the very parish we were sitting in. He saw us and came up to talk to us and congratulate us (and I quickly tried to hide the fact that I had been shedding more than a few tears of exhaustion). Before our conversation ended, we asked him for a blessing for our family and then he left. After he left, we looked at one another and were amazed by the unexpected grace God had given our little family that night. In a time when we needed it most, Jesus not only welcomed us into His Eucharistic presence, but He also sent one of His dear priests to give our new little family a much needed blessing! We both felt so much more peaceful, and we felt a renewed hope for our family. When I was growing up, my dad would often tell me that he could never leave the Church, because he could never live without the Eucharist. The older I get, the more and more poignant those words are. I was raised to love Jesus in the Eucharist, but as I get older I am able to recognize just how much that Eucharistic Jesus loves me and my family! Yes, He is worthy of my praise and adoration...but I am also so much in need of His love. It is this Love, always present and waiting for our visit, that keeps me going. I've had debates with people about whether or not there is any point in bring an infant or toddler to Mass. This is the reason why they must come! As parents, the greatest gift we can give them is love...but also Love. To bring them to be in the presence of Love Himself, and to know that they are loved and cherished...it truly makes every Mass time struggle worth it. Bring your littlest ones to Mass. Teach them from an early age that all they need is Love. Awesome post! I totally needed to hear that! Speaking of the Eucharist and Love, I cannot help but also think of His Mercy as well, which we celebrate this Divine Mercy Sunday (best chaplet ever!). He showed His love for us by dying on the cross and forgiving our sins. Those same sins are forgiven us (the venial ones anyway) when we receive Him in the Eucharist. "O Blood and Water, which gushed forth from the Heart of Jesus as a fount of Mercy for us, I trust in You."